In a microwave safe dish microwave the Wilton chocolate in 30 seconds, stirring until melted. Remove from microwave and let cool 2-­3 minutes. While the chocolate is melting, line an edged cookie sheet with foil and evenly spread out the broken pretzel pieces. 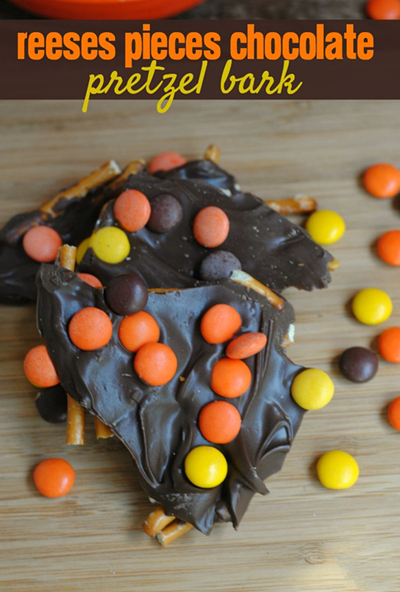 Sprinkle the pretzel pieces with 3⁄4 cup of Reese’s Pieces. spoon or spatula if needed. It doesn’t have to be fancy or neat – the pretzel pieces and Reese’s Pieces will stick to the chocolate. Once the chocolate is spread, sprinkle the other half of the Reese’s Pieces over the top of the chocolate before it sets. Place the cookie sheet in the fridge for the bark to set – about 30 minutes. Remove from the fridge and break the bark into pieces. Enjoy.